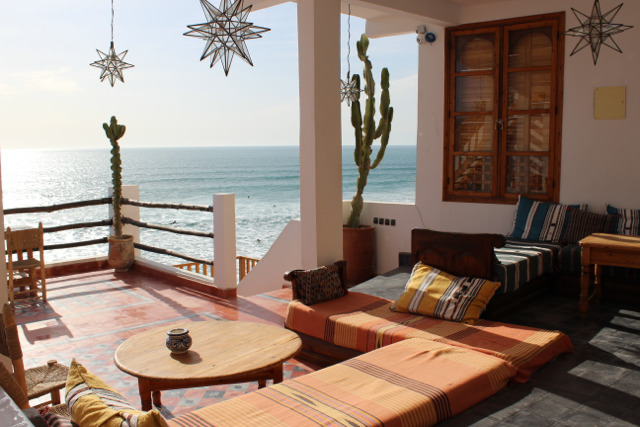 Hash Point Surf Camp, the perfect place to stay during your surf holiday in Taghazout. The Hash point surf camp Beach house has two large communal roof terraces overlooking the waves and its surfers. With 8 rooms we accommodate up to 18 people maximum so there is enough space for everyone. We have high speed internet so you can work at our terrace as well. Enjoy our sun lounges to catch up on your tanning or to watch the amazing star filled sky at night. Guests from all over the world share beers on the terrace and enjoy our delicious bbq. We watch surf movies on the big screen once a week. Choose from a bed in a shared twin/triple room, double room or enjoy the more comfortable en-suite room with private bathroom. All of which have access to the great camp facilities and of course our roof top terrace with the beautiful view over the ocean. 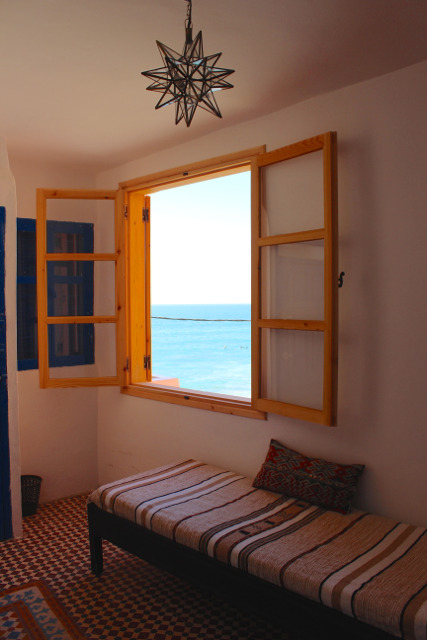 Our surf house is located at the beachside of Taghazout, a charming fishing village famous for its food and hospitality. And most important, world class surf breaks right on its doorstep. Flawless right-hand waves, beautiful beaches, and local Moroccan adventures are all just a stone’s throw away—so from surfers, to travellers, digital nomads to families—there is something here for everyone. Relax on our roof terrace where we serve healthy breakfast, traditional Berber and European dinners. Watch the famous moroccan sunsets or check the surf right from your seat. Sunset from one of the surf camp bedrooms. The camp contains all of the twin shared rooms along with the great amenities for all of our guests. From healthy breakfasts on the ocean view terrace to the comforts of free wifi. This is where you can let us take care of the little things so that you can soak up all that the coast of Morocco has to offer. What does the camp provide? View from our upper terrace. We have two en-suite rooms available in the house. These spacious rooms have a private bathroom so you feel more comfortable during your stay. The side view to the sea makes it possible to watch the amazing sunsets from your window. If you book your Surf School Package and would like to stay in the en-suite we charge an upgrade of 140 euro per week. We look forward to chill with you on our beautiful surf camp roof terrace. 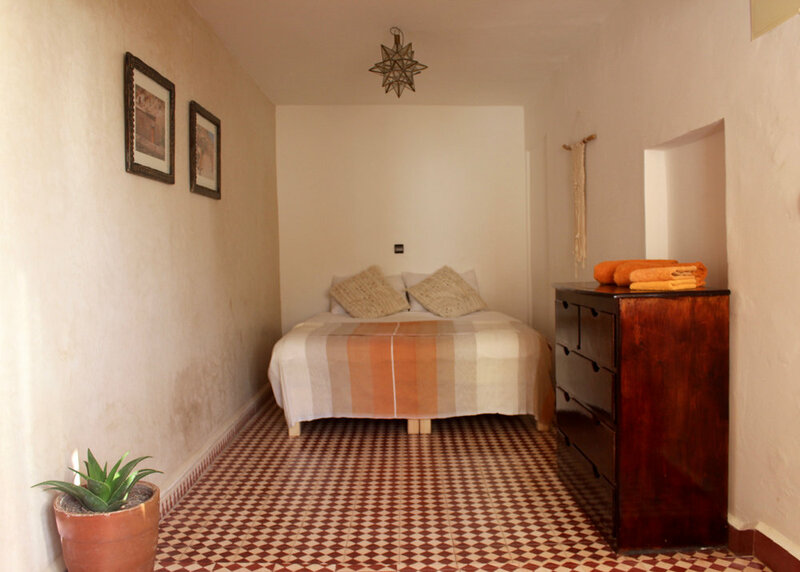 If you have any questions or special requirements, or are hoping to head out to Taghazout in a large group, just drop us an email and we’ll be happy to help you find the perfect accommodation for your stay. 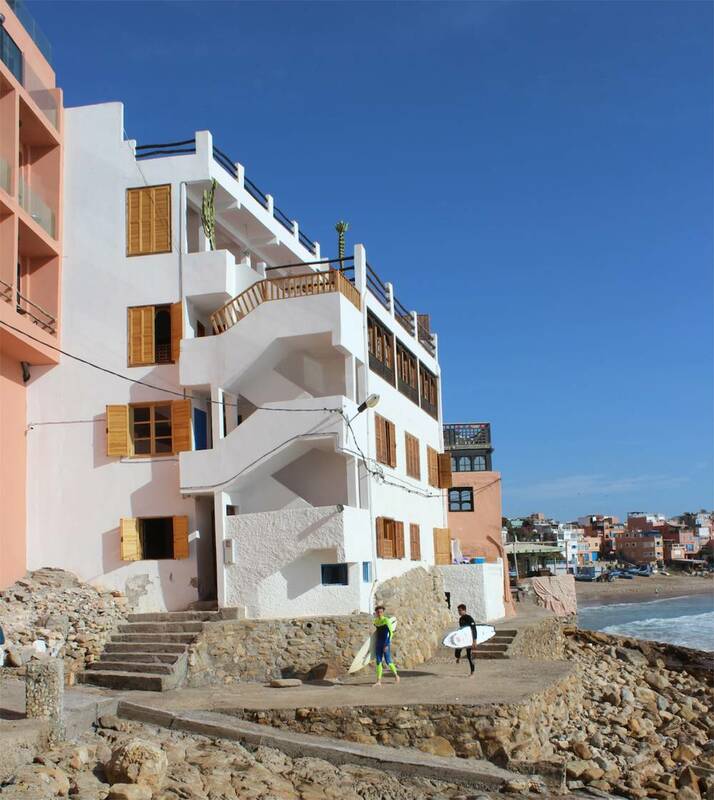 For a full list of everything else you can do while you are in Taghazout and more details on the Hash Point Surf Shop, take a look at our Activities page. Watching beautiful sunsets from our ocean-view terrace. An absolutely stunning view from the main surf camp roof terrace.